PREP: Slice the bacon and cook until crispy. Drain the bacon on a paper towel and save about 2 Tablespoons of the fat. Finely chop the cooked bacon and set aside. Finely dice the onion, parsley and fresh dill (dried dill is fine, too) NOTE: You want all of your ingredients to be prepped, because once you peel and slice the potatoes, you want to add the "dressing" so that it better absorbs into the potatoes. Boil the potatoes, skin on, until fork tender (approx 20-30 minutes) in water. Drain and allow to cool so that they can be picked up, and held into a clean tea towel. TIP: Hold a potato in a tea towel and grip with one hand. Rub the peel off with the towel, and the other hand, and the peels should come right off! Once all of the potatoes are peeled, cut each potato in half and then into fairly thin slices (about 1/4")into a large bowl. 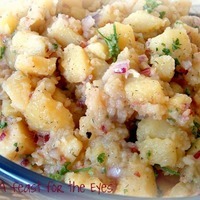 Pour the vinegar, salt & pepper, to the warm potatoes and wait for a few minutes, so that it absorbs. Add the bacon, onion, salt and pepper, and dill. Add the reserved bacon fat, and chicken stock. Gently stir with a large spatula, being careful not to press the potatoes too much. Add about 3/4 cups of the vegetable oil (you can always add more). Gently combine. Add 1 teaspoon of white sugar-- not too much! Taste the salad. Adjust the salt, if necessary. Add a little more vinegar, so that it has a mild tartness to it. The potato salad should have a nice sheen to it, but not be too oily. Add a little oil at a time, until you see a very light sheen. I like to add the fresh parsley, last. It's best served at room temperature. We love this with German Wiener Wurstl (veal sausages). It's delicious cold, but ideally, you want to serve it room temp-- never hot! That's Bavarian "blasphemy"! Can't wait to try it. Usually make the Northern German Hot salad, no mayo. I'm looking forward to trying this recipe. I've been looking for a non-mayo based potato salad similar to one I tried at a small family deli in upstate NY. This seems very similar.